What We’re Learning From You! On February 19th, about 75 community members gathered to attend our Town Hall meeting to hear updates from our Board of Directors and Staff. President Tom Carling and our Board acknowledged that during the past few years, NYI has been through a tremendous amount of leadership transition and financial instability. We have not been as forthcoming about our challenges and our plans, and some priorities didn’t get the attention and resources that they deserve. 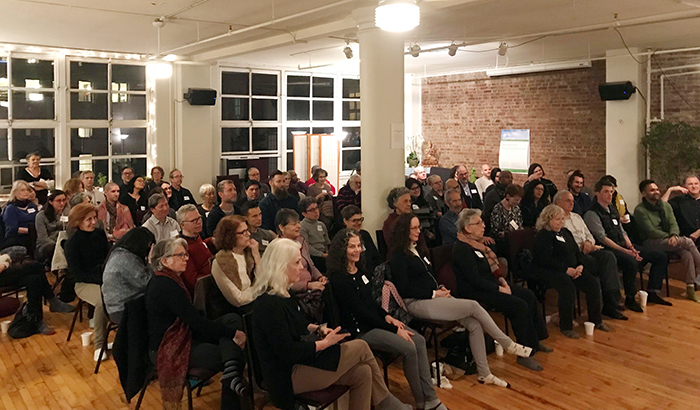 Attendees then broke out into discussion groups to share their thoughts and reported back on how to strengthen our community and your sangha experience at NYI. •Strengthen our work towards a more diverse, equitable and inclusive community by reinvigorating our Diversity Committee. •March 5th — We followed up the Town Hall by sending out a Community Survey to get more detailed feedback on our programs and teaching. •March 21st — We held our first membership committee meeting which is planning activities and outreach to involve more of you. •March 25th – We launched our new monthly email newsletter not only highlighting upcoming programs, but also a way to update you on our progress towards serving you better. •April – We are reconvening the Diversity, Equity and Inclusion (DEI) Committee as soon as Co-Chairs are confirmed and ready to launch. •June – We are planning a special member appreciation event. Stay tuned! And, what are we learning from the Community Survey? •206 of you responded — certainly a sufficiently robust group to give us a good sense of the range and variety of your perspectives. Thank you! •The most frequently attended programs are our Daylong Weekend programs and our ongoing Sits and Sanghas. Based on your responses to the survey, this trend seems likely to continue. •Suggestions for improvements resonate with much of the feedback from the Town Hall, so we totally hear the message: engagement, engagement, engagement. More engagement with NYI teachers and each other. •We also heard that many of you want deeper and longer studies with the Buddhist principles and suttas, and more personal guidance on how to grow your practice. •The most frequently proposed guest teachers you’d like us to schedule are: Tara Brach, Joseph Goldstein and Sharon Salzberg. We’re happy to inform you that we’ve reached out to each, so please stay tuned for updates on new programming based on your input. •The NYI teachers that you said have most inspired you are: Jon Aaron, Bart Van Melik, Gina Sharpe, and Rosemary Blake, among others. We intend to invite them, and all others named, to teach more frequently. Your comments and responses are rich and almost overwhelming! We’re just synthesizing and analyzing them now. We’re also planning to share the data findings and summarized comments with our two community-wide committees: Diversity, Equity and Inclusion and Membership. We hope they’ll help us interpret and identify more priorities for the next year or two. If you are interested in joining either or both committees, please email your contact information to: info@nyimc.org and note which committee(s) you are interested in joining. On a closing note, congratulations to Vasudevan Panicker and Katrina who won the drawing for a free Daylong program of their choice! Thanks again to all of you who responded to the Community Survey!